Yesterday (Friday, October 26th, 2007) we ventured outside and opened the windows for a while, for the first time since the wildfires began here last Sunday evening. The sky was blue with streaks of low white clouds. A few large grayish clouds drifted high overhead. The air seemed nicer outside than inside. But it's the microscopic particles that can injure you or even kill you. This morning it smells smokey outside again, because the winds have shifted. Every car in the parking lot was clean as a whistle -- except mine. It looked like it had been sitting untouched for several months, but it was less than a week. I drove slowly to the car wash, and used the light spray to mist down the car before blasting it with the high-powered wash. That way I could minimize the release of dry particles into the air. Then we drove by the post office. The box was overflowing with junk mail. Then we drove home. Every car we passed was clean. The soot and ash ruins your paint. I make friends who stop by climb through the window, so I didn't have to dismantle the wet towels at the bottom of the door and the paper towels jammed in the cracks. One friend was complaining of feeling like he had allergies. "I never get allergies" he said. I reminded him that I'm pretty sure he had the same problem four years ago after the Cedar Fire. A neighbor -- a fireman -- was pulled off the line after 43 hours straight. He is getting a few days off now. His hands and wrists are black from the soot. They had him lie down and swallow some fluid that makes him cough up stuff, but it only helps a little. The smoke they breath when they are fighting forest fires is different from cigarettes or from when they are fighting house fires, in terms of the most likely toxins to be found in it. Further away from the fires it all gets mixed together. Hucking a fire hose is hard work -- but using it is the most dangerous part. They get so close the fire sometimes licks them. It comes at them from surprising angles, it breathes, it spreads out its attack, it focuses. As you push one way and the wind pushes another, the fire dances. It frolics. It plays with your life. It seems alive -- and intent on killing you. "I saw the wind-driven flames go right between my legs!" my friend tells me. "That's when I decided it was time to back off." He was fighting the Witch Creek fiasco. Winds were so strong they could see flames rolling up, over, and then DOWN nearby hills. When the flames go UP, sometimes they form a swirling tornado of fire. Television crews interviewed people who saw 200-foot tornados of flame. My friend saw numerous 50 and 60-foot "pillars of fire." The highest power lines would still be charred in conditions like that. I asked him about the sparks going even higher. "Oh, yeah. Way, way higher." Fire spreads a lot like cancer. They can hose down a fire line, especially with air support (which was mockingly late, and probably less than a quarter the number of aircraft it should have been), but they can't stop a fire that bursts out everywhere in a matter of minutes. Is there any insurance company which can afford several billion dollars in losses a couple of times per decade? No. But rich people can buy commercial firefighting services, who will hose down your perimeter with "eco-friendly" fire retardant. They won't do your neighbors' house, unless they also paid for the service in advance. Isn't there a better way? Night firefighting requires a lot of sophisticated equipment because cheap infrared goggles won't do. Weak, ground-based spotlights won't do. You could light the scene with mirrors from space, but you have to have global companies making a good clean American dollar for that to happen. Objects placed in Low-Earth-Orbit have ZERO chance of becoming long-term space debris because the pieces, if destroyed, would quickly fall to earth and then incinerate in the upper atmosphere. If they are made of the right materials, it's no more pollution than a single house fire, of which there are millions every year. Space-based mirrors could be used for city evening and morning light. They could light a stadium or allow a forest fire to be fought at night when the winds are often calmer and the moisture content of the air is usually higher. This technology is cheap in comparison to what it costs NOT to have it available to the planet! And a lot of people would line up for the chance to work in space. Other clean-energy systems exist, and many of them need to be used together. One, which I mentioned it in my previous newsletter, and which takes advantage of the principles embodied in the whirling funnels of fire seen so frequently during the recent wildfires, is the Atmospheric Vortex Engine. These could be built around San Diego to produce CLEAN electricity. Unlike similar Solar Chimneys, the vortexes can be temporarily shut down when emergency aircraft need to fly low over an area. The slightly-warmed air which the Atmospheric Vortex Engines send into the upper atmosphere can be generated with passive solar heating methods. One would simply be transferring existing heat from one place to another. It would help keep temperatures DOWN locally, and yet have NO net effect globally! Instead, greedy utilities will do anything to keep the 1,000-megawatt nuclear reactors operating, because they hardly have to pay ANY insurance. You'll be lucky to get a tenth of a penny on the dollar after a nuclear accident (if you survive), thanks to the Price Anderson Act -- an unworkable public insurance policy fraud, first passed in 1957 because no insurance company would take on the risk of insuring nuclear power plants. Nuclear power plants have other hidden costs, but appear to operate in the black because they get practically free fuel, and practically free fuel removal services -- promised, anyway. Not delivered, because Yucca Mountain is a financial and scientific boondoggle doomed to failure. After more than 60 years, there is still no viable, safe, cost-effective solution to the nuclear waste problem. Yet still, the industry creates more nuclear waste every day, on the PROMISE that waste disposal is a solvable problem! The nuclear power industry loves to watch the price of oil go up, because it also makes alternatives more expensive. Even renewables become more expensive as oil prices rise, because they must be built and transported and constructed before they can be used, and each step burns oil. Already-operating nuclear power plants are less effected in the short term by oil price increases, making them look better on paper as oil prices go up. The 104 nuclear power plants in the United States generate 10,000 pounds of high level nuclear waste -- the stuff no one knows what to do with -- EVERY DAY, at the rate of about 250 pounds PER DAY PER PLANT. To give you an example of how deadly that 250 pounds is, one thirtieth of teaspoon of the element tritium is all a plant is allowed to release PER YEAR without exceeding the normal allowable limit. Except that additional "accidental" releases are invariably overlooked by regulators, and major releases are gratuitously dismissed as impossible by these same regulators. It defies the laws of physics, and the law of averages. Uranium, before it goes into the reactor, is relatively free of so called "fission products," and handling such fuel is about as dangerous as handling Depleted Uranium weapons -- which isn't safe, but it's about 10 million times SAFER than trying to handle spent nuclear fuel. There's no protective suit that can give a person more than a few SECONDS of life near spent fuel. In the midst of a meltdown, where the fuel is burning (VAPORIZING) and releasing the pent-up fission products which the fuel has been generating since it was placed in the reactor, no one can get close to put out the fire. All "modern" nuclear reactors use essentially the same FISSION process as a nuclear bomb. But they spread the process out over time, from millionths of a second (in an atomic explosion) to years (in a nuclear reactor). The fuel is removed from the reactor after about five years. During that time, it is "poisoned" with fission products. In the event of a nuclear accident, these will get out in large quantities, along with lots of other radioactive materials. Nuclear power plant operations allow for DAILY RELEASES into the environment. Fission, fusion, and activation products, and particles of the original uranium, plutonium, or thorium are all released. Nuclear power plant operators boast that their plants "cannot explode like a nuclear bomb." But in truth, they are just a slow-motion nuclear bomb. AND don't forget: A steam explosion is also possible. The fuel in a reactor cannot be packed tight enough to create a nuclear explosion, but a steam explosion can release a thousand times MORE radioactivity than a nuclear bomb would release. After a major release, you'll probably be told to plug up the cracks around the doors with wet cloth, and to duct-tape the edges of the windows. You'll be expected to stay indoors for weeks, while some of the most dangerous radioactive substances, such as Iodine-131, decay. Iodine-131 has a half-life of about eight days, so it takes about 80 days for the levels to drop to below a millionth of the original level, and another 80 days to drop to below a millionth of that. When you have a gazillion trillion billion particles being released, you need the full millionth of a millionth! So always pack a lot of water and be ready to sit tight. There are a spectrum of other elements that will be released, with a rainbow of half-lives. Strontium-90, for example, has a half-life of 28.8 years. In addition to the damage caused by radioactive decay, many of the radioactive elements in spent nuclear fuel are potent chemical agents. In strong winds, most of the problem quickly becomes someone else's problem. But regulations and emergency plans for nuclear power plants only expect releases to be dangerous within 10 miles of their fences, which is preposterous. Considering all the dangers, it's a wonder that nuclear power ever took hold anywhere in the first place. But when one considers all the clean alternatives that are available now, it's obvious that greed, lies, and corruption are the only things keeping nuclear power going. One accident will explain it all in terms everybody can understand, but waiting for such awful PROOF should not be necessary. Meltdowns are nasty things. Hospitals fill up so fast that if they can't save you, they won't even let you in. No comfort for the dying. 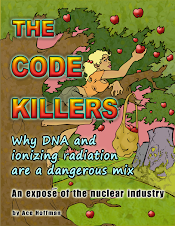 And even if you feel fine, a swipe with a Geiger counter might determine you're actually one of the doomed ones. As oil closes in on one hundred dollars a barrel, as the polar snow melts and the summer rains stop coming, as war-for-oil becomes openly accepted as state policy, as tropical diseases spread because climates change, as precious resources are carelessly thrown away -- we have to ask ourselves why our share of the work hasn't made a difference -- why it wasn't enough. What did WE do wrong? The only possibility for preventing nuclear disaster in America is to shut the plants down. So why don't we? I presume San Onofre -- the nuclear power plant on the edge of disaster (always terrifying, but right now threatened by the nearby SoCal fires) -- is still operating, even as the fire continues to burn near the power lines "incredibly close" as one reporter described it. The local, state and national bureaucracies do not have the willpower or good sense to shut the plants down forever and build atmospheric vortex engines (for example) instead (Google it). A medical director from a local hospital said that the particulates from the fires are very dangerous, but don't worry, they'll eventually get washed down the drain. (When we have rain, but who knows when THAT will be?) Other "experts" are telling people NOT to wash the ashes down the drain -- and don't sweep or blow them -- mist them down until thoroughly wet, and then scrape them up. The medical doctor -- the one who says the particles are very dangerous, adds: "don't let your children play in the ashes" and also says that hospital masks are "practically useless" against the dust, because the particles are so small. But a spokesperson from another hospital said they are giving such masks to employees as protection. Everyone is saying how nice and well-behaved everyone is. True enough -- why do you think I like it here if not for that polite, laid-back, calm attitude of the typical Southern Californian? I loved it the minute I got here. But what if hundreds had been surrounded by fire, and engulfed? It happened to several people in the Cedar / Paradise fires of 2003, and these winds were worse, and the number and size of the fires that suddenly broke out were worse, too. The mandatory evacuations worked -- this time, because "only" two people have died and "only" 1000 homes have been lost (so far). Everyone is already patting themselves on the back. But we are only a couple of wind shifts away from a "real" disaster. Right now, Congressman Darrell Issa is saying that "every asset in the country" was available for us, because fire season hasn't started anywhere else yet, and "it was the first big fire of the season." We saw one of the planes arrive on Saturday evening -- a huge four-engine seaplane that looked like the Spruce Goose (but with only two engines on each side, instead of four). But where were the rest? They didn't arrive for three more days. Everyone -- EVERYONE knew this was coming. Everyone knew when, too. The whole region had 24 to 48 hours to prepare. To pretend that we were prepared is preposterous. And to say that we're good at beating these things now is equally absurd. Congressman Issa is saying: "We're not New Orleans." It sounds good, but we were lucky, too. With San Onofre, the time to prepare was yesterday. Congressman Issa could know this if he tried, but of course, he'll undoubtedly never study it enough to dare to lose political friends and corporate support -- and future elections -- since "anti-nukers" are ALWAYS mocked as "alarmists" and then they are falsely accused of being "unscientific." If Issa, Bilbray, Hunter, and other local Congresspeople in the House, or Boxer and Feinstein in the Senate won't take control of San Onofre AND SHUT IT DOWN FOREVER, who will? Currently, the Horno Fire covers approximately 10,000 acres, having burned six more square miles since morning, and is still only 40-50 percent "contained." A DC-10 is being used to do some of the air drops in the county. Air drops end each evening -- just when the winds generally die down and they would do the most good, but without sophisticated night goggles and related systems, it's considered too dangerous. And such equipment is considered too expensive to install in a 30-year-old converted DC-10 passenger jet, for instance. Low Earth Orbit (LEO) space-based mirrors could provide the needed light for firefighting to continue without the wind, but NASA is busy launching plutonium-based space probes to look for life on Pluto (and as a cover for military plutonium spy satellite launches). What if the DC-10 crashed into San Onofre by accident, or because of a nut in the cockpit, like the nuclear submarine crew which falsified documents recently, or the nuclear bomb crew who flew six nuclear-tipped cruise missiles across America without authorization a few months ago? "Most firefighters were pyros when they were kids" a firefighter told me recently. The guy who said it was one of the guys who is risking his life on the line today. I know him well enough to HOPE he's one of the ones protecting San Onofre. But there are REAL nuts out there, too. Some of these fires were arson (someone believed to be starting a fire was reportedly shot and killed by police in nearby San Bernadino County). Like yesterday, I'm still sequestered, only worse, because I-5 North -- the main artery out of San Diego -- is closed, because it runs right by the Horno fire. Every major highway out of San Diego has been closed at some point in the past 50 hours. I-5 South, just a few feet west of I-5 North, is open somehow. Obviously, they're playing it very close, they are NOT taking an "abundance of caution" to close this main artery, "just in case." Since I-5 is the main artery, I can't say I blame them for that. They can always close it if the winds change, right? Right now, winds are below the speed that cars drive (less than about 75 to 80 miles an hour in that stretch of highway most days, and boy am I going to get Californians in trouble for that comment!). The ridge runs East of, and parallel to, the highway. Winds usually (and currently) go West to East -- across the highway and up the ridge.. If the winds change suddenly, it could flood the entire area between the ocean and the ridge with flaming sparks in a matter of SECONDS. Other fires, even miles away, that create their own artificial winds, can cause the sudden wind shifts, so it is NOT predictable. That's one reason they are now reporting (10:00 am Wednesday, October 24th, 2007) that they've lit backfires East of the I-5, perhaps half a mile inland, on the other side of the ridge above a run of power lines. The highway usually runs only about 300 yards from the ocean all along that area. RIGHT NOW San Onofre Nuclear (Waste) Generating Station is being threatened by the Horno Fire on Camp Pendleton. It sits along the thin strip of land which lies between the I-5 Interstate highway, which is just a stone's throw from the nuclear power plant, and the Ocean into which it pours its tritium, krypton, argon, xenon, and more than 100 other radioactive elements, even on a good day (let alone after an accident). The Horno fire has burned more than 6,000 acres in less than half a day, and the fire is within a few miles of the nuclear power plant, and MOVING TOWARDS IT AS THE WINDS ARE PICKING UP. This is an extremely dangerous situation. Power lines are also threatened. I expect the NRC (Nuclear Regulatory Commission) to do NOTHING. I expect the NRC to say, as they did with 9-11, that "it's not our job." The NRC doesn't put out brush fires -- they aren't the CDF (California Department of Forestry -- aka "Cal Fire"). They don't worry about hijacked airplanes, either -- they aren't the TSA (Transportation Security Administration). Go ahead -- next time you talk to the NRC, ask them about the ongoing danger from hijacked jets, and they'll tell you that is not a regulatory concern, not a reason to shut the plants, or to stop building new ones, because it is the position of the NRC that other agencies have solved that problem since 9-11. The NRC will ignore the possibility of a single engine private plane being loaded with explosives and flown into a nuke plant. They will ignore the possibility of a hijacked private mid-size business jet ("all you need is a wad of cash and a credit card" to rent one and load it with any cargo you want). They will ignore, ignore, ignore these and a million other dangers. The NRC is a pack of lying, criminally-negligent, industry lapdogs. Yesterday, when I warned about what could happen if San Onofre melts down, the NRC took the opportunity to "unsubscribe" from this newsletter! They are criminally ignorant and blissfully oblivious to the obvious. And they want YOU to remain that way, too. Please write to the Office of Public Affairs (OPA@nrc.gov) and ask them to READ my newsletters, post them online (like I do! ), and RESPOND to each one properly! And please say a prayer for Southern California, which is threatened constantly by San Onofre Nuclear (Waste) Generating Station -- threatened with millions of deaths, trillions of dollars in damages, and massive quantities of grief and pain, which would make what SoCal residents have suffered so far from these wildfires trivial by comparison. In San Diego alone, there has already been a billion dollars in housing losses (more than 1000 houses lost), about half that many businesses and "other structures" have been destroyed, nearly 500 square miles have burned, about half a million people have been forced to evacuate, and, worst so far: Two deaths and about 10 firefighters and two dozen other people injured -- NOT INCLUDING the hundreds of people, mostly old people, who are already going into the emergency rooms for respiratory illnesses. Citizens will die for years because of these fires. I wonder if my bladder cancer surgery last August (2007) would have been considered "elective" surgery earlier this week, causing a delay in the operation that saved my life (so far). It apparently took the efforts of three Congressmen to overcome the bureaucracy keeping military helicopters from helping in the firefighting efforts. One or two military aircraft were flown yesterday, apparently for PR purposes -- for news cameras to film. But the main fleets remained grounded for bureaucratic reasons. Once the bureaucratic roadblocks were removed, the equipment -- now more than a day late -- was still nearly 20 buckets short. And it's not certain if those helicopters which don't have buckets will be of any use, since -- at least as of last night -- it's not clear how long it will take the buckets to arrive. Fortunately, due to the "anti-bureaucratic" behavior of a National Guard general, multiple C-130s were ready to participate in the firefighting efforts. But as of yesterday evening, they were still waiting for fire retardant to be delivered by a contractor. This is the result of "outsourcing" your safety to private companies. One last thing. They are now reporting (10:30 am, Wednesday, October 24th, 2007) that the transmission lines from San Onofre have gone down "for the third time in the past 10 hours." This one seems longer and more difficult to deal with and they don't appear to expect them to come up any time soon. It sounds like something went wrong with the backfire burn, but they aren't reporting any such thing. Again we are being told, by utility company spokespersons, to turn off everything we don't need or there will be "brownouts and / or rolling blackouts." I've done that. And both sides of I-5 are now open. People have been waiting "for hours" according to the reporter on the scene. If we lose power, I'll have to turn on the wind-up radio to get the news. But I think the wind-up radio is in the detached garage. If we lose power, I'll hand-write the next newsletter, then turn the laptop on long enough to type the letter, then just turn my computer on (with the battery back-up system) long enough to send it. I wish I had more wind-up lights! One would HOPE that San Onofre is being shut down, immediately and for the last time. Permanently. One can HOPE the lesson is learned: CLOSE THESE AWFUL PLANTS and don't open any new ones. My step-mother just called. She wanted to know "how we are." "We're only being slightly poisoned, but the worst may be yet to come." Below is my newsletter from yesterday (with two minor typographical errors corrected). The NRC officially ignored it yesterday. Perhaps today they'll listen (but don't hold your breath). Right now, I'm sequestered. I can't breath the air out there in the real world. I can't leave my computers on because they heat up the house. I can't go anywhere because most of the roads are blocked and to get anywhere, I'd have to wait in traffic and smoke for hours and hours. I'm stuck. The cause is wildfires, a natural occurrence. But what's NOT natural is that they are combined with drought conditions due at least in part to global warming. Humidity around here is in the 5% range. Winds upwards of 60 miles an hour send noxious smoke hundreds of miles out to sea each day, only to have it drift back onshore at night. Yesterday was relatively good here in Carlsbad, because the firestorm made its own wind, and that self-made wind actually brought cleaner sea air onshore in a few places in San Diego County, California, and one of those places getting the clean air was mine. Not so today. Today you can't see the sun through the smoke. Today they are telling us -- again -- to be ready to evacuate at a moment's notice. Today they are telling us that downed transmission lines throughout the county are causing spot shortages of electricity, and to conserve power as much as possible. My air cleaners are going full-blast. My computers, my televisions, my security system, my phones, my printers, my Tivo -- what to turn off, what to leave on? They say to text message a certain number to get the latest updates but the cell phone lines are all clogged up. They say to go to various web sites for the latest updates but access is slowed down by the tens of thousands of other residents who heard the message. They say they are doing all they can do. Yes, TODAY they are doing all they can do, but in all their YESTERDAYS, when they could have prepared for this disaster, they did VIRTUALLY NOTHING. More than 1000 homes have been destroyed, nearly 300,000 acres have burned, one person has died, and several dozen have been injured, including five firefighters. Billions of dollars in losses in the span of a few hours. The county of San Diego was NOT prepared for the Witch Creek and Harris fires, despite the warning provided in 2003 by the Cedar and Paradise fire! My stand-alone hard drive is by the door, ready to go. A week's worth of food and water is also ready to go. My most precious historic books are in a canvas tote bag, ready to go. Clothes are in a knapsack. We have batteries, the car has gas, and my four-wheel drive vehicle doesn't have to stay on the pavement -- I can drive right over hill and dale to escape. But really, there is NO escape. With more than a quarter of a million residents already under mandatory evacuations, not a hotel room within 100 miles is available, and the air is polluted everywhere in Southern California. So here I sit, windows shut, doors shut and paper towels stuck in the cracks, and wet towels along the bottom, and the air cleaners going full-blast. But what if, instead of smoke from forest fires, it was poison gas from San Onofre Nuclear (Waste) Generating Station? San Onofre is a disaster-waiting-to-happen. Just look at it! The old rust-bucket, which breaks down regularly, feeds power lines which run for miles across rugged terrain. if they snapped in high winds, fires, or an earthquake, it could cause a meltdown, because ALL nuclear power plants require OFF-SITE POWER continuously. Otherwise, they have to rely on emergency generators to keep them from melting down, and those generators are, themselves, old rust-buckets. Two of San Onofre's VICE-PRESIDENTS recently were forced to retire because otherwise they were going to face disciplinary action -- including, probably, BEING FIRED FOR INCOMPETENCE. The nuclear industries' own last resort for quality-control recently put San Onofre on the list of "worst-of-the-worst" -- right alongside Palo Verde, the worst-run nuclear power station in America. A lackadaisical attitude towards training was one reason for the low grades -- people would arrive late and care little. INPO (Institute of Nuclear Power Operations, a voluntary self-regulating organization founded in 1979, in the wake of the Three Mile Island disaster) realized this and didn't like it. And they'll put up with almost ANYTHING. People are working double-shifts at the plant because manpower is WAY SHORT and there is much work to be done, because the whole place is falling apart with age, even as they are trying to upgrade everything to take advantage of the FREE GIFT that California and the Nuclear Regulatory Commission recently gave them -- a 20-year life extension to go on polluting, creating mountains of hazardous radioactive waste, and risk DISASTER on an UNPRECEDENTED SCALE for another two decades. Of course, it doesn't have to be like this. There are clean, renewable-energy alternatives which don't have any of the risks of nuclear power. But NO ELECTED OFFICIAL has enough understanding of the dangers to want to stick their own neck out to save SoCal. Many of them DON'T EVEN REALIZE that the "spent fuel" is unsafely stored outside the containment domes. They believe the utility when its spokesperson claims that dry cask storage is safe. They believe the utility and the nuclear industry when it claims that Yucca Mountain will soon take all the nasty waste away. They believe the "Health Physicists" when they say that a little radiation is like a vitamin for the immune system, and might prolong life. They believe more research needs to be done. They believe anything they can which will relieve them of their sworn duty to protect California from nuclear disaster. But like the fires, which come from time to time, there is a time and a place for everything, and if we don't stop taking the easy route today, we'll end up taking the hardest route of all tomorrow. Air cleaners and wet towels won't stop the deadly radioactive gasses emitted during a meltdown. Millions of San Diegans will be killed. All the cooperation of all the emergency responders won't make a bit of difference. Every hospital will be filled with vomiting, bleeding, dying citizens, and every house will have the smell of death, and every street will be strewn with writhing victims and lifeless bodies. People will continue to die IN DROVES for decades (and in lesser quantities for thousands of years), and there won't be a thing the mayor or the governor can do about it. No other fate can possibly await us if we don't SHUT SAN ONOFRE IMMEDIATELY. Every year or so, California builds the equivalent electrical generating capacity of ALL FOUR NUCLEAR POWER PLANTS IN THE STATE. So why can't we close these deadly behemoths? GREEDY OWNERS and LAZY POLITICIANS. There is no other reason. Since I-5 is the main artery, I can't say I blame them for that. They can always close it if the winds change, right? Right now, winds are below the speed that cars drive (less than about 75 to 80 miles an hour in that stretch of highway most days, and boy am I going to get Californians in trouble for that comment!). The ridge runs East of, and usually (and currently) upwind from, and along, the highway. The Horno fire has burned more than 6,000 acres in less than half a day, and is it is within a few miles of the nuclear power plant, and MOVING TOWARDS IT AS THE WINDS ARE PICKING UP. This is an extremely dangerous situation. Power lines are also threatened. I wonder if my bladder cancer surgery would have been considered "elective" surgery earlier this week, causing a delay in the surgery that saved my life (so far). Re: Unsubscribe-me-please from "OPA OPA"
This "unsubscribe" (shown below) from the NRC is disgusting. The NRC is disgusting. Write to them and tell them so! NRC WILL **NOT** BE REMOVED FROM MY NEWSLETTER SUBSCRIPTION LIST. YOU SHOULD READ THESE NEWSLETTERS INSTEAD, AS REQUIRED BY YOUR MANDATE TO RESPOND TO CITIZEN COMPLAINTS. THESE NEWSLETTERS ARE ALL VERY RELEVANT COMMENTS TO NRC ACTIONS. THEY HAVE BEEN SUBMITTED TO THE NRC FOR COMMENT AND TO FIX THE PROBLEMS YOU ARE CREATING. San Onofre is a disaster-waiting-to-happen. Just look at it! The old rust-bucket, which breaks down regularly, feeds power lines which run for miles across rugged terrain. if they snapped in high winds, fires, or an earth-quake, it could cause a meltdown, because ALL nuclear power plants require OFF-SITE POWER continuously. Otherwise, they have to rely on emergency generators to keep them from melting down, and those generators are, themselves, old rust-buckets. One might recall, last April (2007), when a section of freeway near the San Francisco-Oakland Bay Bridge collapsed after a gasoline tanker truck overturned and erupted into flames. One might recall a fire in a tunnel near Baltimore, when a train burned for five days and the heat was estimated at more than 1,800 degrees Fahrenheit, exceeding design limits for nuke waste transport casks. It's easy to forget, because it happened July 18-23, 2001, but we MUSTN'T forget. The same tunnel will probably be used to transport nuclear waste from Calvert Cliffs Nuclear Power Plant to Yucca Mountain. Over 1000 tons of High Level Nuclear Waste is currently being stored at Calvert Cliffs, requiring hundreds of individual shipments. Every other nuclear power station in America ALSO has many tons of nuclear waste stored dangerously OUTSIDE the "containment dome." One might recall (if you were me) that the Department of Energy told me -- when I mentioned the tunnel fire at a hearing on Yucca Mountain, and said "how are you going to guarantee that all those nuke transport vehicles won't get involved in something like that?" -- that they would be tracking ALL THE OTHER TRAINS on all the other tracks that the nuke waste train would go near, so there could never be a combination of a nuke train and a fuel or hazardous / flammable waste train in a tunnel, on a bridge or overpass, or just simply passing each other at the same time. One would have to be very dense -- denser than D.U. -- to believe ANYTHING the D.O.E. tells you. Today's fiery pileup in a California truck tunnel just points out, once again, that the nuke waste problem hasn't been solved. It WON'T be solved -- transporting waste will ALWAYS be hazardous, risky, leaky, and foolhardy. But sooner or later, we're going to do it anyway, because the waste HAS TO GO SOMEWHERE. But transporting the waste won't be safe, and it won't be easy. In today's fire, chunks of concrete and steel fell from the ceiling -- a container of nuke waste could be crushed and breached. Today's pileup happened just THIRTY MILES from Los Angeles and closed one of the most important escape routes out of the city. Nuke waste transport routes cover hundreds of thousands of miles of old, dilapidated roadways. Bridges thought to be safe are collapsing around us, yet still the plan moves forward, as if there is no danger. As if the containers will be made MAGICALLY strong enough to survive anything that can happen. It's a pipe-dream. It's terrorism. Domestic terrorism by our own government against our own citizens. But what ARE our options? We can't leave the waste on the coasts, subject to tsunamis. We can't leave it near population centers. We can't leave it in earthquake zones. We can't just leave it be -- it MUST be monitored for hundreds of thousands of years. It will cost a bundle. The costs have not been factored in to the price you pay for nuclear-generated electricity, no matter what the nuclear industry claims to the contrary. What about Yucca Mountain, I hear some naive pro-nukers cry! "That will solve our problem once and for all!" No it WON'T. It won't even solve our problem ONCE, let alone, for all time. Yucca Mountain probably will never be completed because 1) The people of Nevada have a say in their future, and they HATE IT. and 2) It's a scientific failure and a financial boondoggle, and 3) Even if built, it would only hold TODAY'S waste -- if that. It won't hold the waste the nuclear industry plans to make TOMORROW. Nuclear power is a crime against humanity. To call it anything less is an understatement. Nuclear power's supporters, with almost ZERO exceptions, all make a living, or made a living, from within the nuclear industry. Nuclear reactors generate about 20,000 pounds -- 10 tons -- of high-level radioactive waste EACH DAY in America alone -- 100,000 pounds of NEW "HLRW" worldwide every day. The day MUST COME when this madness stops. Many pro-DNA people ("anti-nukers" is the term pro-nukers use, but we're really just "pro-DNA") believe that ONLY a severe accident will stop the juggernaut. But humanity cannot wait for that -- the cost -- trillions of dollars and hundreds of thousands, if not millions, of lives -- would be too great to bear. It would bankrupt America, or any country it happens to. Sanity -- stopping nuclear power ENTIRELY and IMMEDIATELY -- is the only choice. That, or hell on earth. If you think a 15-truck fiery pileup in a truck tunnel in California, or a 5,000 degree fire in Baltimore, Maryland, or leaky containers along routes that pass within a few miles of 200 million Americans are bad things, then you need to protest not just "new" nuclear power, but "old" nuclear power, too. A closed reactor is much less vulnerable to terrorism, human error, environmental catastrophes, and aging ("embrittlement") accidents than an operating reactor. AND, perhaps most important, it's no longer generating new nuclear waste. Nuclear power was a dream of cheap energy that failed miserably. It's time to put the nightmare to rest. Ho Hum. Today, pro-nuker Al Gore won the Nobel Peace Prize for his environmental charade. He shares it with the UN's IPCC (International Panel on Climate Change). A few years ago (2005) the International Atomic Energy Agency -- pro-nukers in all possible ways, as long as they get to watch -- received the "prestigious" award. In 2002, ex nuclear-navy reactor operator Jimmy Carter won the Nobel Peace Prize. Carter was President during the Three Mile Island accident and toured that facility to prove it was safe (it wasn't). He campaigned on the promise that we would only use nuclear power "as a last resort," only to get into office and -- ho hum -- declare that "we are down to our last resorts" because the Organization of Petroleum Exporting Countries (OPEC) raised the price of a barrel of oil a couple of bucks (to about 1/4 of what it is now). Extreme pro-nuker Mikhail Gorbachev, former President of the Soviet Union, won the Nobel Peace Prize in 1990 (probably nobody has done more damage to the earth through radiation poisoning than the Russians). In 1967, Japanese Prime Minister Sato received the Nobel Peace prize when he decided Japan would never possess, create, or import nuclear weapons. But they have over 50 nuclear power plants, which poison their land, air, and water every day, and could result in "Genpatsu-Shinsai" (a meltdown caused by an earthquake) any day. On the plus side, the Pugwash movement was the Nobel Peace Prize winner in 1995, and Dr. Helen Caldicott is a past Nobel Peace Prize nominee (a movie about her, If You Love This Planet, won an Academy Award for best documentary in 1983). However, Dr. Caldicott was not a Nobel Peace Prize winner, and Harvey Wasserman, who ALSO should have won it by now, hasn't even been nominated (and nor was John Gofman or Alice Stewart, both dead now, nor many others who deserve such honors for speaking out against the nuclear madness that infects the planet). The International Physicians for the Prevention of Nuclear War received the 1985 Nobel Peace Prize for educating the public about the dangers of nuclear weapons. But what about the dangers of attacking nuclear power plants WITH nuclear weapons (or with conventional weapons)? Dr. Bennett Ramberg warned us about THAT in his book, Nuclear Power Plants as Weapons for the Enemy: An Unrecognized Military Peril (1985), but never received proper recognition for it -- such as a Nobel Peace Prize. 50 years ago, Senator Al Gore (Al Gore's dad) was on a committee promoting the use of nuclear energy in space, and was also pushing nukes on land and sea. Like father, like son. What's the world coming to? Nuclear death by radioactive poison gas, that's what! I had cancer earlier this year (bladder cancer). About 1/3 of all humans will get cancer, and MOST of those will die of it. The rates of numerous other diseases caused by radiation are going up, up, UP. There is no "Nobel Environmental Prize" but obviously Al Gore would have won that this year, if there was one. Once again they've made the Nobel Peace Prize the equivalent of the Nobel Environmental Prize, and failed to give it to someone who's trying to stop war. Instead, they've given it to a pro-nuker -- again. Al Gore is a liar. The Nobel Peace Prize is soiled -- again. We are sick of your lies, Mr. President. And Mr. Vice President Al Gore, we are sick of your lies too. Right the wrongs about the environment, Mr. Gore. Tell the truth about radiation, Mr. Gore. Tell us the things your father never told us. Do not perpetuate his lies about nuclear space policies any more! The website of the Nuclear Energy Institute www.nei.org includes a page of �Endorsements of Nuclear Energy� and among those quoted are Al Gore: �Nuclear power, designed well, regulated properly, cared for meticulously, has a place in the world�s energy supply,� he is reported to have said. IAEA and its head, Mohamed ElBaradei, share the Nobel Peace Prize -- only giving it to the DOE, the NRC, or the nuclear industry itself would be more ridiculous! environmentalist -- but it's just acting; he's really a pro-nuker! Last night was the 79th Academy Awards (Oscars) where the motion picture industry honors its members for great acting. And if you watched the Academy Awards last night, you saw Al Gore acting like an environmentalist. But don't be fooled -- it's just acting. There's a lot of nuclear power promotion masquerading as environmentalism, and Al Gore's movie is no exception. His support for the theory of Global Warming comes at a price no one should have to pay: We will all be irradiated by the results of his (secret) pro-nuclear agenda. Perhaps the truth about nuclear power is just TOO INCONVENIENT for Al Gore, hence, it's not discussed in his Academy Award-winning documentary. Radiation is mentioned only once, and then, he is only talking about solar radiation. Nuclear power is mentioned only once, and he's only talking about his trip under the Arctic Ice in a nuclear-powered submarine. And nuclear weapons are mentioned only once, for their shock value. The closest the movie comes to talking about commercial nuclear power is during the credits, when viewers are told to ask their utilities for "renewable" and "green" energy. Global warming is happening, but watch out for this man -- his solution is worse. The inconvenient truth about Al Gore is that he's a big, fat liar. To back up my comments in the previous newsletter, here are some clips and quotes from the past decade, indicating Al Gore's pro-nuclear stance and his reluctance to admit it. A rude, erroneous, and libelous flaming email from a former member of the United States House of Representatives (defending Al Gore). It should be noted that the property value ALONE of San Onofre, if it were converted to condos, a seaside resort, hotels and such, even though it's a relatively small nuke facility in terms of land-area allocated, would probably FAR OUTWEIGH its "income" to the state as a nuke facility -- not even counting against it the deaths it causes in the local community, from both regular (as in, daily) and "unplanned" (but common enough to be called regular, too) radioactive poison gas releases; not counting the problem of what to do with the highly radioactive and dangerous used nuclear reactor cores; not counting the risk of an accident or terrorist act that could kill hundreds of thousands of Californians; not counting the fraud involved in keeping the plant open (SCE, the owner, lies about everything and nearly went bankrupt several years ago because they are so greedy); not counting the fossil fuel used by the 1400 or so workers going to and from the plant each day; not counting the valuable metals (such as titanium) that are made unrecycleable by being used in a nuke facility where they become poisoned with radiation; not counting the AGENT-PROVOCATEURS who infect our society and destroy our democracy in order to keep the local activists confused, the press silent, and the plant running; not counting the cost-benefit to the state that a renewable energy industry would bring in jobs and exports; not counting the unreliability of the power they mistakenly call "baseline;" not counting the FACT that Yucca Mountain will probably never be built (and shouldn't be); and not counting thousands of other things. Shutdown is the only reasonable alternative -- unless we LIKE a future consisting of dying gruesome and painful deaths in poverty-stricken quarantine zones, which will be our fate -- perhaps as early as tomorrow or today -- if we keep San Onofre open. In the press release shown below, among other mistakes, it should say "thousands of tons" not "hundreds of tons." It should demand IMMEDIATE SHUT-DOWN of San Onofre. It should recognize that Senator Kehoe has been on NUMEROUS committees which have, one by one, continued to permit San Onofre to operate FOR DECADES. She has abdicated her responsibilities OVER AND OVER AGAIN. This meeting won't change a thing, except to make it look to some like democracy is in action. It's not. Naturally, the meeting is being held during regular business hours so that most people cannot attend. They never miss a trick. >Below is an Alert from our friends at Alliance for Nuclear Responsibility. We hope as many of you as possible will take advantage of this opportunity to tell your state legislators what you think about nuclear power! >Please take this opportunity to speak to California's legislators on the economic impacts of California's reliance on aging nuclear plants and new reactor designs proposed for our state. >Last year, California's legislators tasked the California Energy Commission to analyze the costs, benefits and risks of the state's reliance on aging nuclear plants and this year we have seen a few legislators propose possible future reactors in our state. These actions call for public participation to ensure that all concerns are addressed to ensure California's energy future will be a product of responsible energy planning. >The Alliance for Nuclear Responsibility respectfully requests that all other legislative actions to further nuclear relicensing or new reactors be held in abeyance until the CEC analysis is complete, adopted and recommendations are implemented. Furthermore, the Alliance requests that this Committee recommend that no further actions be taken by California's utilities towards license renewal or new reactors until the above criteria are met. >California is blessed with a coastline that is beyond compare. Billions of people flock to our beaches, visit our theme parks, climb and ski our mountains. Are we willing to risk this abundance on a short-sighted, expensive and heavily subsidized energy future that will leave behind a legacy of highly radioactive waste on our fragile earthquake active coast forever? >California does not need to make a Sophie's Choice for our energy future; we have made great strides for a clean energy future that will be the template for the world. We thank Senator Kehoe's Committee for the opportunity to share our concerns.